Dennis Merley concentrates his employment law practice on counseling and risk prevention. 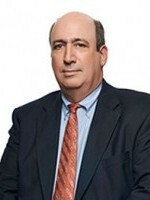 He advises management on a broad range of work place issues, including employment discrimination, harassment claims, accommodation concerns, wrongful termination, minimum wage and overtime, downsizing, severance agreements, unemployment compensation, drug and alcohol testing, employment contracts, Family and Medical Leave Act and affirmative action issues and employee handbooks. Dennis also works extensively in supervisor development and training. He has been selected for inclusion in the The Best Lawyers in America for 10 consecutive years. Ryan Olson represents clients in business, employment, and labor matters in Minnesota and North Dakota. His business consulting and litigation practice ranges from assisting clients with commercial collection matters to assessing, negotiating, and litigating business tort claims. 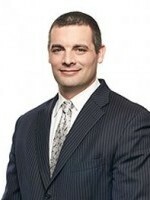 Mr. Olson also has extensive experience representing secondary market mortgage lenders in repurchase litigation as well as defending mortgage lenders and servicers against federal and state statutory claims, such as Truth-In-Lending Act (TILA), Real Estate Settlement Procedures Act (RESPA) and Minnesota Residential Mortgage Originator and Servicer Licensing Act (MOSLA) claims. Mr. Olson advises employers on personnel and policy issues, non-competition agreements, and represents them in federal and state court, arbitration, and in administrative hearings on numerous employment and labor issues. Mr. Olson also assists federal and state contractors/subcontractors with their federal and state affirmative-action obligations. His assistance to contractors/subcontractors ranges from development and implementation of affirmative-action plans to assisting contractors/subcontractors with compliance audits. Minnesota Employment Law Letter provides a three-part subscription package to deliver the practical, hands-on advice you need to manage your Minnesota workforce safely and in compliance with Minnesota and federal laws. That's because the newsletter's editors are Minnesota attorneys who defend and counsel employers statewide. Each issue also keeps you on top of Minnesota court and U.S. Supreme Court decisions that affect your workforce, all reported with Minnesota's local laws and policies in mind. You get the information you need to stay in business — and out of the courtroom. 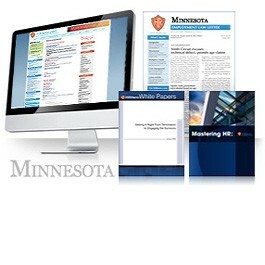 Minnesota Employment Law Letter — 12 monthly issues mailed to you and also available online. (Digital-only versions are available with an HRLaws subscription) You also receive email notifications once a month and periodic News Alert by email as needed. GUARANTEE: Your 100% satisfaction is guaranteed. If for any reason you are not completely satisfied with Minnesota Employment Law Letter, simply let us know within 90 days, and we will issue you a complete refund.